Have you considered putting yourself forward for the LCC Board of Trustees? Do you want to be more involved in the London Cycling Campaign? Could you put yourself forward as a trustee? The London Cycling Campaign, as a charity, is overseen by a Board of Trustees which is responsible for the overall strategy of the organisation. Elected by the LCC membership and working with the staff team, the Board governs the organisation and oversees everything from strategy development to finances. Half of LCC’s Board of 10 trustees is elected each year, with each trustee serving a two year term. Only members of the London Cycling Campaign may stand for election. Candidates must be proposed and seconded by two other LCC members. Board members come from diverse walks of life. Their backgrounds range from entrepreneurship to academic research; their experiences range from community volunteering to competitive sport. What they all have in common is a passion for cycling and for making London a better city, through cycling. LCC needs people who can see the bigger picture, work well with fellow Board and committee members and who can bring to the table their ideas, enthusiasm and opinions. On a practical level, you will need to attend bimonthly board meetings and attend at least one committee, which can also meet up to six times a year. These meetings take place in the evening at LCC’s office near London Bridge, generally start at 6.30pm and last up to two hours. There are five vacant seats in this year’s trustee election. The nominations deadline for candidates in this election is 9am on Monday 11 August 2014. To stand, please complete the Board nomination form and return it to the London Cycling Campaign office, or email a scanned copy to agm@lcc.org.uk, by the above deadline. 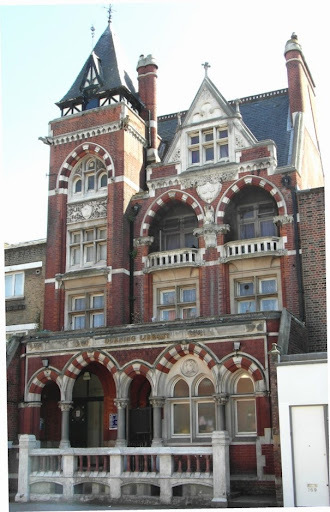 Join us tomorrow, Saturday 26 July 2014, for our latest easy going ride when we will be looking at our local Lambeth libraries. 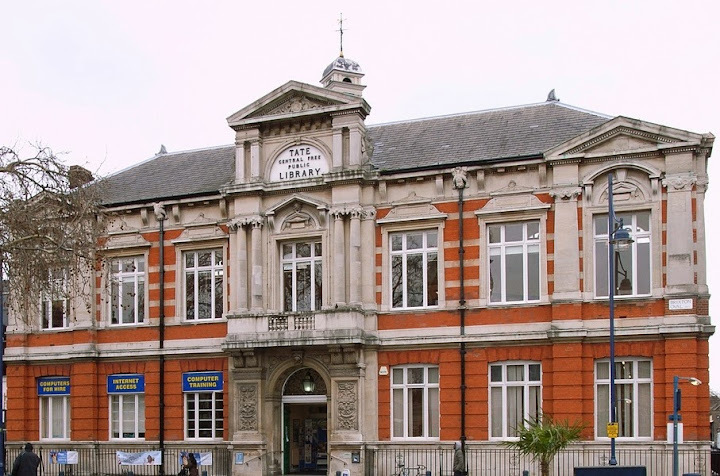 Lambeth is fortunate to have a wide range of libraries around the borough each purpose built with a distinctive look. On this ride we will explore the rich architectural variety of those often overlooked, often imperilled beacons of local culture, our libraries. The ride looks at all Lambeth’s public libraries. It considers the influence of the Victorian philanthropists who founded many of them and looks in particular at the work of S.R.J.Smith. Smith, the architect of the Tate Gallery, designed many South London libraries: ‘enjoyable examples of late Victorian municipal showmanship’ (Pevsner). Meet 10.30am outside Tate Library, Brixton. Finish around 4.00pm, with a break for lunch. Expect an easy-paced, unhurried ride with plenty of stops. Join us on Saturday 26 July 2014 for our latest easy going ride when we will explore the surprisingly rich architectural variety of those often overlooked, often imperilled beacons of local culture, our libraries. 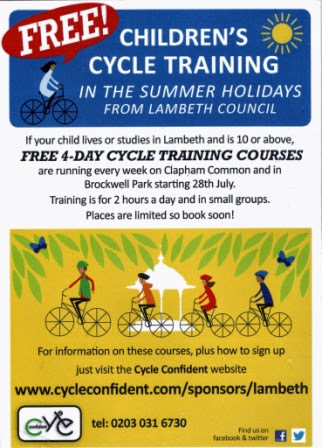 If you're over 10, living in Lambeth, and want to gain more cycle confidence sign up now for the summer holiday cycle training courses being run on Clapham Common and in Brockwell Park. 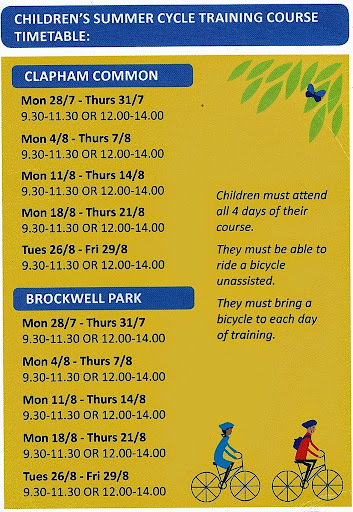 The courses start on Mondays in July and August and consist of four morning or lunchtime sessions which will equip young people to cycle confidently on the roads. To take part you must be able to commit to attending all four sessions and must be able to bring your bike along. 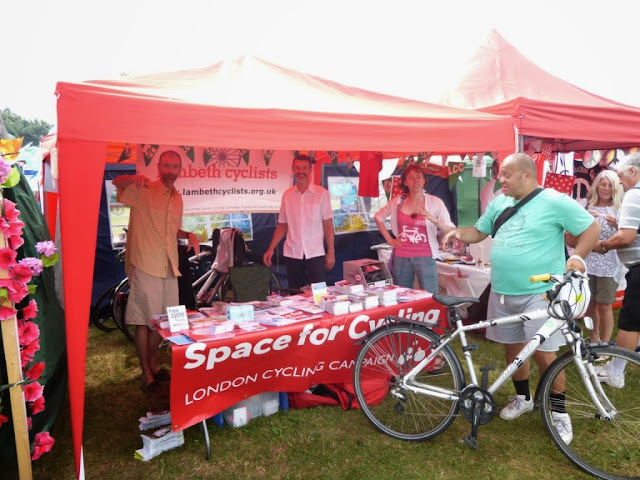 This Saturday and Sunday, 19 and 20 July 2014, we will have a stand at the Lambeth Country Show where we will be handing out maps and cycling information and talking to people about cycling in Lambeth and the Space for Cycling Campaign. We will be in the charities section of the show - come and say hello. Congratulations to local bike shop Brixton Cycles which has won Best Small Bike Retailer at the prestigious London Cycling Awards. 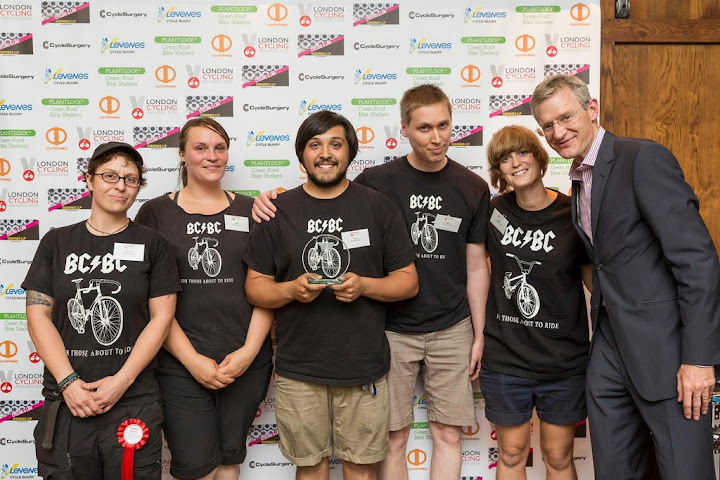 The award was presented by journalist and cyclist Jeremy Vyne (pictured with the Brixton Cycles team) at the event held on 16 July 2014. The shop was started in 1983 as a workers' cooperative in a central Brixton location. In 2001 it relocated to its current location on Stockwell Road and continues to offer customers quality bikes, accessories, repairs and servicing. Cycling Brand of the Year: LOOK MUM NO HANDS! Ashok Sinha, of London Cycling Campaign congratulated all the winners saying “It was a great pleasure to give recognition to a breadth of people and organisations, from cycling brands and retailers to community projects and champions. Our winners have worked tirelessly to promote cycling so we feel honoured to be able to give them the thanks they deserve." 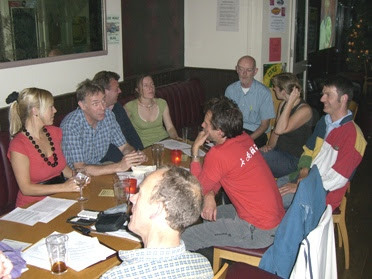 We hope you can join us on Tuesday, 15 July 2014, for the next Lambeth Cyclists meeting. At the meeting we will be joined by Lambeth Council's Sustainable Transport Team who will be giving an overview of cycling developments in the borough. This will be our opportunity to hear about progress on the implementation of the Lambeth Cycling Strategy and how we achieve the vision of making Lambeth the most cycle friendly borough in London. We will also be hearing about exciting developments such as the Brixton masterplan, junction improvements, new cycle superhighways, quietways and the new inner London cycle grid which will all bring benefits for cyclists in Lambeth. We will also be hearing about the Oval junction proposals. The meeting will also be a chance for us to feedback to Lambeth on recent developments such as the Clapham Old Town scheme and raise any cycling issues you may have. Transport for London have released their proposals to make the road junctions around Oval tube station safer for cyclists. 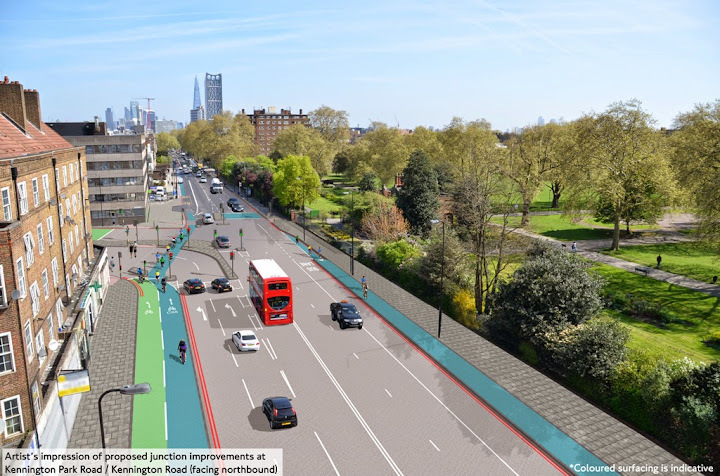 Following consultation with LCC and others the four junctions in this area, which link major roads including Kennington Park Road, Clapham Road, Brixton Road and Camberwell New Road, will be made safer for cyclists. 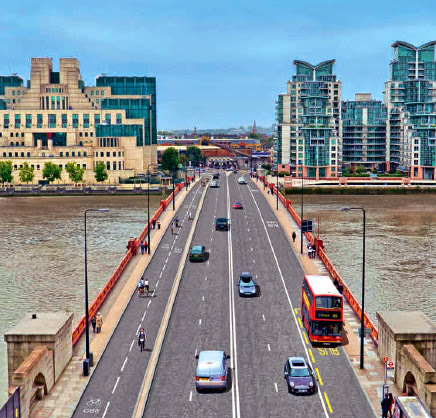 The plans propose restrictions on motor vehicles, separate traffic light phases for cyclists, segregated cycle lanes and measures to reduce speeds all of which will bring benefits for cyclists and, we hope, encourage more people to cycle in Lambeth. Transport for London have launched a consultation on the proposals - see https://consultations.tfl.gov.uk/betterjunctions/oval and have arranged two meetings to discuss the proposals with cyclists: Thursday 17 July 2014: Montgomery Hall, Kennington Oval, SE11 3-7pm and Saturday 19 July 2014 at the Oval Farmers' Market, St Marks Church, SE11 11am-3pm. The closing date for the consultation is 17 August 2014. 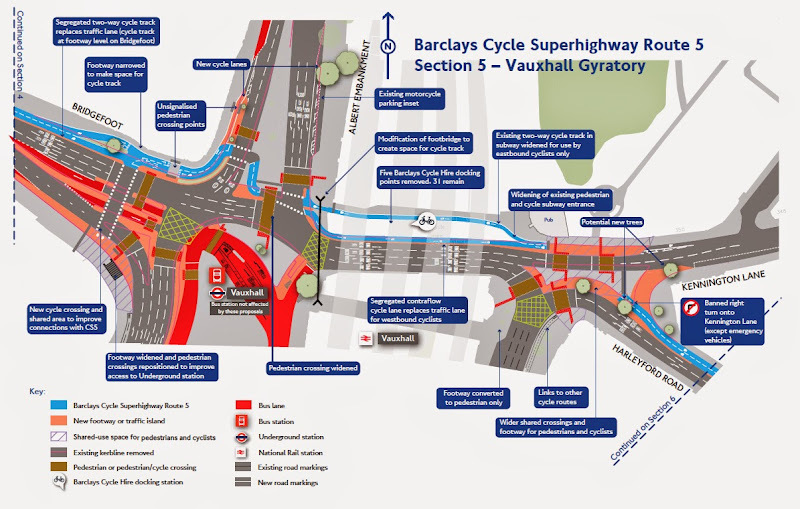 Lambeth Cyclists welcome these proposals. We believe that the changes will make the area much more cycle friendly, create real space for cycling and encourage more people in Lambeth to cycle.